Growing a beard is like getting a puppy – everyone wants one, but a lot of people aren’t prepared to put in the effort to do it right. Growing a beard can be daunting, but luckily, there are a few things you could do to make the whole experience easier and, of course, make your beard look amazing in the process. Keeping your hair and beard clean isn’t just an aesthetic imperative, but a hygiene imperative as well. That being said, cleaning your hair and your beard are two very different processes. Beard hair doesn’t have the same texture as the hair on our head; it’s coarser, scruffier and more prone to misbehaving, that’s why it needs special attention and treatment. Of course, there are men who just use good ol’ regular drugstore shampoo to tend to their beard, while others prefer to opt for a beard wash soap. In order to groom your beard to perfection, you need to buy all the right products, and as straightforward as beard soap might sound, it is actually anything but. It takes a lot of time to grow a great beard that’s manageable and manly at the same time, and perfect beard soap is a step you don’t want to skip on. So, if you’re looking for some quality info on how to groom your mane and which soap to use for what purpose, keep on reading. In this article, we’ll go through our top 10 favorite picks with in-depth beard soap reviews, give you all the needed info about this godsend of a product and help you choose the best beard soap for your needs. The American made Henry Cavendish beard soap bar has everything you’d want from a good beard wash. It’s bigger than most other beard soaps on the market, so it’ll easily last you from 3 to a whopping 6 months! How’s that for a bargain? This beard soap creates rich, creamy and long-lasting lather that will ensure a comfortable and hydrated shave. This round beard and shave soap is utilized the old-fashioned way – with a mug and a brush. It features all-natural ingredients without any artificial colors or fragrances, which means that most skin types won’t have any negative reaction to it. Thanks to its moisturizing properties, the Henry Cavendish soap will make your beard smooth and will also soften it up if you let it sit on the beard for a couple of minutes. This beard softening is crucial in order to avoid skin irritations and minor shaving cuts, and this skin-soothing soap bar does just that. The key ingredients you’ll find in this natural beard soap are shea butter and coconut oil, which act as a subtle moisturizer; soy extracts that smooth and soften the skin; and lastly, the soap features generous amounts of glycerin, which contributes to the silky and creamy, rather than an overly foamy lather. As far as the fragrance is concerned, this beard soap has a mild, barely-there lavender smell, which is well-accepted by most of the customers; however, there are some guys out there that perceive this smell as too ‘feminine’ and would prefer a beard soap without smell altogether. If you’ve never used beard soap before, the Henry Cavendish is a good place to start, because, after the purchase, you’ll receive an email with detailed instructions on how to use it, so that the room for a mistake is close to zero. The Mr. Natty Natty’s beard soap and conditioner is a perfect soap for those with sensitive skin that want just a little bit more moisture to their skin but without the fuss of having to apply two different products. This natural beard soap is free of chemicals such as SLS, parabens, petrochemicals and it doesn’t contain any artificial colors, fragrances or preservatives. The mixture of rosemary and Shea butter, combined with natural peppermint oil will soothe your skin and protect it from the harsh elements, as well as make your beard shiny and soft. The potent antioxidant properties of the Mr. Natty Natty’s beard soap and conditioner will reduce and most likely completely eliminate the skin irritation that often occurs when growing a beard, especially during the first couple of weeks. The soap is long-lasting, especially if you use it once or twice a week – that way it could last for about a year, depending on your beard size, of course. The discreet ‘forest’ scent of this beard soap is a true breath of fresh air first thing in the morning, and it has proven to be quite popular with the ladies as well, according to some satisfied customers. If you’re wondering what a ‘forest’ scent is, exactly, imagine the scent being on the lines of herbal and cedar wood smell. The one complaint people had on this otherwise great soap bar, is that the bar itself was too hard, and required a lot of water and rubbing to get it to lather properly. Additionally, the packaging of the product hasn’t been thought through entirely, so that the first time you take the soap out of the tin and put it back in wet, the soap bar can adhere to the bottom of the tin, making it hard to pull out again. While this might be a nuisance, it definitely isn’t a deal breaker. Honestly, the Honest Amish is a classic among the beard soaps. This is a beard and body soap that has a non-drying, mild formula suitable for almost any skin type and for beard and face wash, too. It exclusively contains natural ingredients and has a unique blend of eucalyptus, cinnamon, and clove essential oils. The way this soap cleans your beard is through yellow clay that pulls slightly on your beard, extracting dirt and excess oils, leaving it hydrated and soft. With this organic beard soap, it’s really easy to lather up and fast – just wipe the soap across your beard once or twice, and a rich lather will develop effortlessly. However, its greatest strength is also its greatest weakness – you want to keep the Honest Amish out of running water because it’ll melt away in front of your eyes. If you pay attention to keep this soap dry and contained in a tin or a bowl, it’ll last you for some time, although not as much as our first two picks. This bar soap is so supple that even humidity of shower water nearby is more than enough to make it lather up upon hitting your beard. Some people will enjoy the ease of the user experience, while others would prefer if the soap was a bit harder – to each their own. 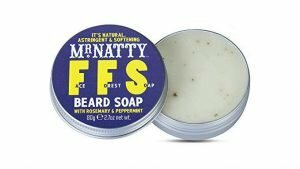 If you do prefer a mild, yet harder soap, you might want to look at Mr. Natty Natty’s Face Forest Natural Beard Soap. The all-natural scent is moderately strong, which poses an obstacle to some customers; however, the scent doesn’t linger long after you wash the soap out. One user noted that despite the brand’s claims, this soap left his skin dried out completely, although that probably has more to do with individual tolerance levels to the soap ingredients, and less with the soap quality. 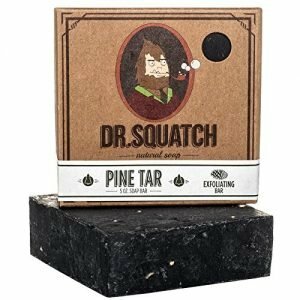 Yet another fantastic choice for those looking for all-natural, high-quality soaps, Dr. Squatch Pine Tar soap is made through a cold process method and will exfoliate your skin like no other. The cold process is beneficial because that way the glycerin is contained within the soap bar and is combined with cold-pressed olive oil and coconut oil as well. This soap will help you say goodbye to dead skin cells and at the same time, it’ll regenerate your beard and make it soft and healthy. Being free of chemicals and preservatives is one of the greatest fortes of the Dr. Squatch soap, and unless you’re allergic to some of the ingredients, it shouldn’t irritate your skin one bit. One major drawback of this men’s beard soap is its longevity. One solution to this issue is making sure it doesn’t come in contact with a lot of water, so you can rub it on your damp hands and then apply it to your beard, rather than applying it directly on the beard. However, even with these precautionary measures, the longevity of the Dr. Squatch beard soap is well below our first top picks, but the soap itself is very high-quality, so it deserves to be on the broader top-10 list for sure. The Maple Hill beard soap has all-natural ingredients that provide a rich lather and generous nourishment to your beard and skin. As an added bonus, it isn’t tested on animals! It will gently clean the beard without stripping it of the natural oils needed to make it shine and behave. The butter and oils in the maple Hill formula will prevent flaking, irritation, and redness, while gently conditioning your beard. Similarly to the Henry Cavendish soap, the Maple Hill also has a distinct lavender smell mixed with slightly oriental sweet orange and patchouli notes. The smell of this soap is very strong and equally as specific, which is why it didn’t end up in our top picks. Its scent is far from universal and it really has to ‘click’ with you in order to fall in love with this beard conditioning soap, but if you do, you’ll be really satisfied with its performance. A lot of users stated that this soap helped them resolve their beard dandruff problem for good. 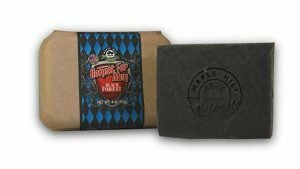 However, there are a few complaints on the drying effect of the Maple Hill soap; as with any other soap, you’ll just have to try out the one you like best, and hope that the ingredients work for you. The organic nature of this soap goes hand in hand with its packaging, which is a recycled paperboard container that won’t create pollution. All in all, this is the perfect ‘green’ soap, ideal for men who tend to their environment as much as their own beards. The Sophisticated Beardsman beard and body soap cater to those men that prefer their soaps to just do their job and be pleasantly scented. 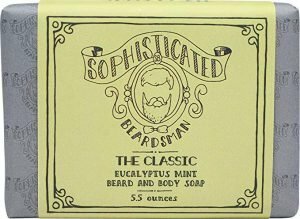 Advertised as a soap that gives you a fresh, outdoorsy smell, the Sophisticated Beardman features mild blood orange notes mixed with a blend of various essential oils. This beard soap is organic and 100% natural, using a mixture of coconut, palm, palm kernel, olive, and non-GMO soybean oil, as well as French Green Clay, Australian Olive Clay, peppermint powder and essential oils of blood orange, vanilla, fir, bergamot, and neroli. each of these oils performs a certain role in the process of moisturization and hydration of the skin and beard, leaving you feeling fresh and your beard feeling soft and nourished. One of the downsides to this soap is that it relies too much on essential oils to do the scent work, without counting on other natural ingredients, which makes the soap smell a bit flat, without any depth and upper and lower notes to it. On the other hand, it lathers quickly and lasts a long time, so if you’re a fan of the mentioned ingredients, go ahead and give it a try. Another Maple Hill product, this black soap for the beard is made out of the finest all-natural ingredients that will give your beard the shine, softness and shape, as well as an amazing smell. Not only does this hand-crafted beauty look manly, but the sublime combination of pine, cedar and vanilla will take you in and make a gentleman out of you. The natural ingredients will prevent any redness, itching, irritation or burning that may occur when using drugstore-bought soaps. 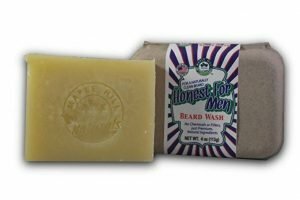 The blend of butters and oils will condition your beard effortlessly, and as with the first Maple Hill soap we reviewed, this too comes with a recycled cardboard packaging. The black color comes from activated charcoal, which helps in prevention of any beard break-outs while also giving this soap its mysterious black color. However, keep in mind that several users noted that instead of conditioning their beards, the specific ingredient blend of this soap made their beards and skin dry out. 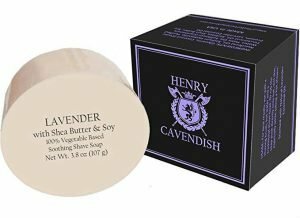 If you have a really sensitive skin, we recommend you stick to the Honest Amish or the Henry Cavendish soaps. This delicate milk soap is as mild as it sounds – hand mixed, made with fresh, raw goat’s milk and combined with essential oils, the Bogue milk soap is rich in nourishing vitamins A, E, B6, B12 and features hydrating protein naturally found in milk. This face and beard soap is handmade in Ojai, California and meant to reduce wrinkles and brighten the skin as well. As you might have guessed, this soap if additive and preservative free and doesn’t have an artificial fragrance, only the one that results from the natural scent of its ingredients. It produces a creamy lather that’s great for defrizzing your beard and leaves no residue on the beard. Goat’s milk is known for its moisturizing qualities, and the infused oils, essential oils and other herbs provide excellent nourishment for the skin. If you’re interested to know more about the ingredients used in the making of this soap, here they are: cedarwood, rosemary, rose geranium pure essential oils, organic kukui nut, avocado, and argan in coconut, palm, olive, jojoba, pumpkinseed, & rice bran vegetable oils, as well as sandalwood-infused safflower oil. While all these ingredients might be fantastic for some, the sheer complexity of the ingredients increases the chances of someone getting an allergic reaction to this soap – which is exactly what happened to some unfortunate customers. This 4-in-1 beard soap is actually perfect for bathing, showering, shaving, and shampooing! If you’ve looked for a practical shampoo/beard wash, that won’t leave your beard looking like a frizzy mess, you’ve just hit the jackpot! Not only is this soap practical for day-to-day use, but it really shines in situations where you can’t have as much luxury while bathing, such as when you’re camping, hiking, or just backpacking with a minimal number of things to carry around with you. But practicality isn’t the only great thing about this soap, there’s also the old-fashioned, yet refreshingly modern pine smell that is equally as popular from generation to generation. 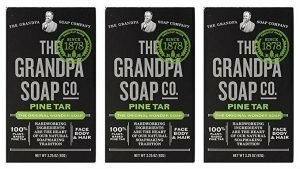 For those you care about being green, it’d be good to know that the Grandpa’s pine tar bar soap is Leaping Bunny certified, meaning that no animal testing or animal cruelty happens in any phase in the process of making this soap! However, the smell seems to be the thing that both attracts some customers, while it has an off-putting effect on others. 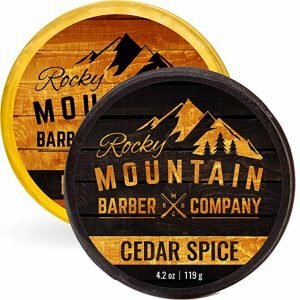 And last, but not least, there is the Rocky Mountain Barber Company’s soap bar that has a 5-in-1 effect – it can be used as a shampoo, conditioner, body wash, face wash (beard is a given) and a hand soap. It features six essential oils: sweet birch, lime, cedarwood, sweet orange, patchouli & cinnamon leaf. This transparent soap comes in two scents: Birchwood and Cedar spice, offering a milder and a bolder version and the exact same nourishment. While neither is overpowering, expect both scents to linger for about 5 hours; the scent won’t be overwhelming but it will be noticeable to the person next to you, so be careful to pair this soap with your perfume well. The blend of all-natural ingredients creates a dense, creamy lather that moisturizes the skin without leaving it squeaky clean. 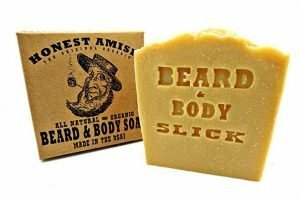 Given how it’s a body soap as well as a beard soap, don’t expect nearly the same longevity as with some other soaps made exclusively for your beard. Shampoos are made to de-grease hair and extract all the excess oils from hair follicles, due to the fact that the skin on our head produces more oil that the hair needs to be healthy. Beard hair doesn’t work in exactly the same way. Because the hairs on the beard are coarser, thicker and less prone to getting oily, it’s really important to always keep some natural oils in the beard – that’s why regular shampoos lead to drying out of the beard usually cause beardruff and breakage as well. Beard wash is created to preserve the natural oils and provide intense care with mild cleansing properties, instead of the other way round. If including yet another product in your morning routine seems too tiresome and difficult, it’s worth noting that beard soaps aren’t meant to be used daily, but rather once or twice a week. Again, this is because you don’t want to strip your beard from its natural oils. Not only that, but the process itself with applying beard soap is fairly simple, although there are some slight differences with every bar and brand. Generally speaking, all you need to do is simply wet the soap bar and swipe it through your beard once or twice (three to four times for longer and thicker beards) and most soaps will start to lather quickly. 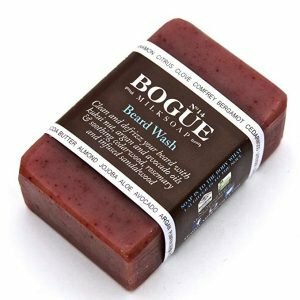 Getting a beard soap might seem unnecessary, but the truth of the matter is that your face, as well as your skin, aren’t made to defend themselves from the filthy city air, so the best way to keep them clean and healthy is to use beard soaps to get rid of dust, pollutants and dirt that collects in the beard during the day. Once you start using beard soap on a regular basis, you’ll notice your beard getting shinier an shinier by the week. Also, if you’re looking to grow a strong, nourished beard, you can opt for a beard growth soap that will help you achieve your beard goals faster. A good beard wash will make your mane manageable and tame and will make you look healthier overall. To top everything off, a beard wash that suits your skin type will reduce any irritations on your skin and keep the itching and beardruff at bay. Now, let’s look at the two main types of beard wash. Similarly to regular shampoos, there are also beard washes that come in liquid and in solid form. Bard wash is an umbrella term that includes beard soaps and beard shampoos. 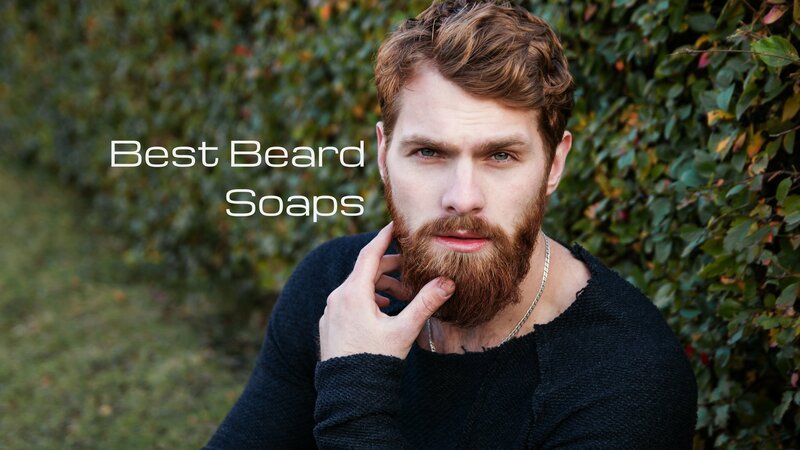 Beard soaps come in blocks or bars, they are in solid form and a lot of men prefer them to shampoos. While both types of body wash do a fantastic job at cleaning your beard, beard soaps have the benefit of being easier to apply all over your face. Additionally, they’re very practical when you’re traveling, because, with a beard soap, spillage and a ruined suitcase isn’t a problem you should worry about. Also, a lot of men prefer to take beard soap on camping, rather than shampoos, simply because they are easier to handle. However, other than the form and the practicality that comes with it, beard soaps and shampoos are exactly the same. Most people tend to think of a beard shampoo when they hear the term ‘beard wash’. One of the great things about beard shampoos is that you have a better control over how much you’re spending with each bathing. Beard soaps may be practical due to their solid state, but no one can deny the added benefit of a liquid cleanser put in a safe packaging that won’t melt off under a stream of water. When picking beard soap, you want to be fast and not spend an eternity exploring all the options and learning about different types of beard soaps as you go along – it’s better to come prepared and know exactly what you’re looking for. That’s why we prepared this buying guide that covers all the important aspects of choosing the right beard soap for your face and beard. The first thing anyone thinks when it comes to size is that more is better, and in most cases, that usually turns out to be true. A large beard soap is expected to last for a long time and be cost-efficient as a consequence, and a lot of the times they are. However, there is also the question of lather and hardness of a soap. There’s no real use in getting a large soap that’ll disappear before your eyes when it comes in contact with water several times – these soaps do make a rich, creamy lather, but this literally comes at a price. On the other hand, it’s possible to find a great, small beard soap that isn’t that quick to lather, that will outlast the large one by a significant margin. Another aspect to consider when choosing a beard soap size is how it fits your hand and is it comfortable? There’s no point in having a soap that slips out of your hands on a regular basis, so try to pick one that’s roughly the size of your palm or a bit bigger. Cleaning is the primary purpose of all soaps, and that includes beard soaps as well. However, with beard soaps, the saying “everything in moderation” comes into full prominence. We’ve talked about how important it is to get a soap that won’t drain your beard of all natural oils in order to avoid breakage and the caveman look – unless that’s your vibe, of course. The best thing to do is to pick a soap that is made of natural ingredients – they are less likely to be as potent and dry out your beard. Look for clay, oats, rice and similar starchy ingredients, because they act as natural scrubs and exfoliators. On the other hand, if a soap doesn’t clean your beard, it’s not a soap, it’s a conditioner. So try to read up on reviews on a specific man soap for a beard that caught your eye and check if it actually does everything as advertised. A lot of soaps leave your skin feeling tight, dry and ready to crack, because they’re too harsh, don’t feature natural ingredients, or have an exfoliating effect that simply doesn’t suit your needs. Look for a beard soap that will lock the natural moisture of your skin and hair in and prevent any dryness as a result of environmental gunk and your beard being stripped of natural oils. Look for soaps that have Shea butter, a blend of essential oils, or if you have extremely dry skin – a blend of cold-pressed oils. The perfect moisturizing beard soap should leave your beard manageable as it dries, without any tangles or knots and looking de-frizzed. However, these criteria are only any good if you have a long, thick beard. How are you to know if a beard soap is any good if you have a short stubble and are just starting to grow a beard? Simple. Just see if your beard and skin feel soft to the touch. If they do, you’ve picked the right soap. The less artificial ingredients in your beard soap, the better. It’s never a good thing to put synthetic ingredients on your face, and beard is no exception. Pay close attention to the label and read it carefully. Does the soap claim it’s 100% natural? Is it organic? Is it vegan? There is a lot of important info on the label, and thankfully, natural ingredients are easy to recognize in a sea of sciency-sounding artificial ones. If a soap bar has a long list of natural ingredients – go for it. Natural ingredients aren’t just the latest fashion trend that people are following blindly, it’s actually quite useful and logical. The high-quality ingredients can make or break a soap bar and whether it will cause a rash, an acne break-out, irritation, redness or the much-dreaded beardruff (like dandruff, just for beard). If you want to minimize your chances of ruining your face for a day or two, our advice is to go natural, without a doubt. The one thing the non-natural ingredients got going for them is their amazing price; they’re most often cheaper by a whopping 50% than the natural beard soaps, but considering they might dry out your skin and cause irritation, a lot of people later spend a good buck on different moisturizing creams and similar product, to try to alleviate the negative effects the non-natural ingredients have on their skin. If you opt for organic, all-natural soap, it can almost always double as a body and face soap, which might end up lowering your total expenses! Usually, a good beard soap is considered to be the one that lathers quickly and easily. We would add that it’s more important for it to lather quickly than easily – if that makes sense. There are some soaps who tend to soften up simply from the humidity of the shower; those are usually the ones that aren’t really long-lasting when they come in contact with water. Of course, no one wants to spend minutes trying to lather up a soap, however, it might be wise from a financial point of view to find a soap that requires some amount of rubbing before developing a rich lather. Needless to say, your beard is very, and we mean VERY close to your nose. This means that it’s important to really be into the smell of your beard soap because no matter how thoroughly you rinse it off, the scent will linger for an hour minimum. Fortunately, there are a lot of natural beard soaps that have a discreet and mild scent that won’t upset your nose or your mood but will blend quite nicely with your everyday perfume. However, some beard soaps make a point out of having a sharp and aromatic smell – some men find this off-putting, while others rather enjoy it. In the end, the most important thing is that you like the scent of your soap, no matter if it goes well with your colon or not. We’re going to be real – given the fact that money doesn’t come easy these days, it’s of vital importance to find a beard soap that fits your budget. What this means is that either you should buy a pricier, but long-lasting soap that will come out cheaper than some average ones after a year of use, or, you can find a good, cheaper soap to use and renew that purchase every other month or so. The smartest thing to do is compare the price with the ingredients – you now know what to look for – and then decide on a soap that fits both criteria. As a general rule of thumb, every natural beard soap below $10 that’s long-lasting is a great purchase, while some of the more expensive ones ($10-20) are a bit up there in the price, but can make up for it with longevity and amazing ingredients. Did you know that you can actually make beard soap at home? Yeah, we know, the DIY enthusiast in us jumped out of joy as well! The ingredients might not be cheap at first, but they can make a lot of soap, which makes this extra step worthwhile and more importantly, worth the money. Just mix 2 tablespoons of jojoba oil (coconut oil will do as well, but jojoba is the closest oil to our natural skin oils), 3-4 tablespoons of liquid castile soap and ¼ cup distilled water. The only thing left is to do after mixing up these ingredients is to put the newly-made soap in a bowl and let it firm up a bit. Also, if you like a specific smell, you can always add some essential oils into the mixture to personalize this beard soap a little bit. This might not be as elegant as buying a soap, but on the other hand, this way you’re in total control of the ingredients. Expert tip: If you have a beardruff problem, washing your beard with cold water could help solve it. Hot water is nice, but it dries out the skin significantly. If you have trouble with your new soap not fitting into your favorite soap bowl, the simple solution would be to microwave the soap for 2×20 seconds or less. This way, it’ll completely melt into the bowl without an issue. For those of you who aren’t as familiar with how to use beard soap, here’s a quick rundown: first wet your beard with cold or lukewarm water, rub the soap under the water. Afterward, soap beard in two simple swipes or more if you have a dense and long beard, rub the lather into the beard and leave to condition for a couple of minutes. Rinse off with cold or lukewarm water. If you’re in a hurry, you can even use the lather from the soap to shave your beard as well. Growing and maintaining a fiercely-looking beard isn’t as easy as one might think. Men put in a lot of effort to keep their beards clean, manageable and neat. Beard nourishment starts with a good beard soap. In this article, we touched upon some of the best beard soaps on the market, we’ve covered all the types and important aspects of beard soaps and hopefully, helped you decide on the right one for you.